The main goal of this project was to design a simple website to showcase the life insurance offerings available for little people. 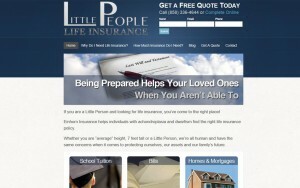 The website gives interested clients instant access to information on the life insurance policies offered, as well as the ability to contact the insurance company directly for a quote. The get a quote form is a custom form, which uses conditional logic and a multi-page process to walk applicants through the process. The site runs on a WordPress-based content management system, which can be easily edited and updated in-house as needed. The quote form is also easily edited through the WordPress administrative dashboard.